Florence Tyler Hanson died October 13, 2018 after a long illness. 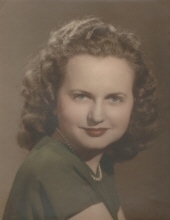 She was a graduate of Georgia Southwestern College in Americus, GA. She was preceded in death by her husband of 62 years, Wallace A. Hanson, Jr.; her parents Marshall & Elizabeth “Lizzie” Pope-Tyler, brothers Watts Pierson Tyler (Doris), Eddie Marshall Tyler (Rosemary) and sister Christine Tyler Jones (Dana B). She is survived by four children: Kathy Hanson, Judy Hanson, aka Alexandra Bryan, Marsha Harding-Nutt (Rob) and Russell Hanson (Yadira); three grandchildren Matthew Crawford, Victoria Crawford, and Elizabeth Harding, several nieces and nephews and cousins. Funeral services will be held Wednesday, October 17, 2018 at 11:00 AM in the Chapel of Mowell Funeral Home. The burial will take place at 2:00 PM at Southview Cemetery in Thomaston. The family will receive friends on Tuesday from 6-8 PM. To send flowers or a remembrance gift to the family of Florence Tyler Hanson, please visit our Tribute Store. "Email Address" would like to share the life celebration of Florence Tyler Hanson. Click on the "link" to go to share a favorite memory or leave a condolence message for the family.